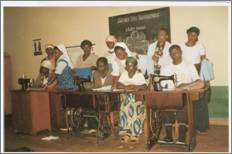 Set up a small work shop: sewing, knitting and embroidery for person with HIV, with the AIDS virus contaminated young women and their children. Framing, learning a profession, providing a social activity for these, earlier excluded, group of women. Costs: 1.447.OOO,- RwFr i.e. € 1800,00. Thank you for your news about the projects and achievements. It is, as you write, true that communication with our region is very difficult, this is due to difficult telephone connections and there is always a distance to travel before we can work with internet, please accept our apologies, this really doesn’t depend on us. We started with sensitizing and explaining the advantage off 'work together'- the mutual support in the event of problems. Not with the arms crossed to remain seated, but taking the initiative. 22 Persons, divided into two groups, accepted the challenge. The start of group 1 had already place, group 2 begins in April 2009. 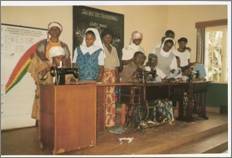 We started with explanation and operation of sewing machines. In view of the majority is illiterate, this took 5 lessons. After a few exercises they able to repair their clothing, to sew shorts and dresses and handkerchiefs to ... They make progress and are very satisfied.